Kempston Cleaning Services specialise in high rise window cleaning, to ensure your building always looks clean and appealing. High Rise building such as skyscrapers, apartment blocks, hotels and office blocks have windows that are difficult to reach, let alone dangerous. Kempston’s professional services include rope access which is specifically geared towards the safety for our cleaners, helping them reach those high windows seamlessly and without hassle. Make contact with us today, and we’ll arrange an appointment to come visit your facility and quote you according to your exact needs and personalised requirements. We also make use of quality chemicals to ensure that our cleaners leave your windows, sills & edges with that sparkling look that we’d expect to see in our own homes.If the windows that we’re cleaning for you are indoors, we’ll make sure your furniture is protected from any chemicals. Our services cover the 5 major city centres and surrounds – our branches are located in Durban, Johannesburg, Cape Town, East London and Port Elizabeth. 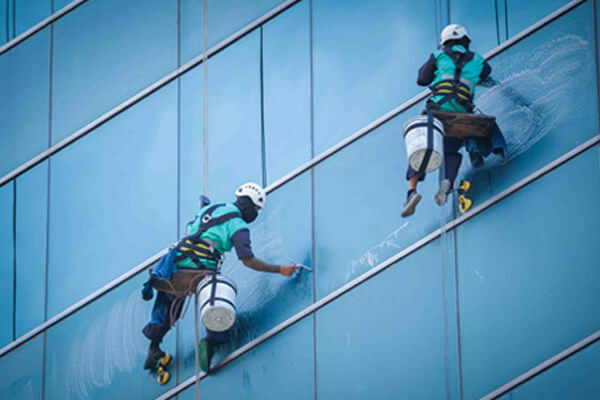 From once-off high rise window cleaning, to maintenance contracts – Kempston Cleaning services has you covered, and while we leave a lasting impression on you; you will leave a lasting impression on your customers that enter your building. Your company image is important to both you, and us. We also offer professional cleaning services for Industrial buildings, commercial facilities (such as supermarkets & shopping centres), Schools, hospitals and hotels, to mention but a few. Bird and Pest control and removal is another area where Kempston Cleaning Services thrives. If you have pest birds on your building, feel free to touch base with us and request a quotation. We clean windows on high buildings, both inside and outside. We offer once-off or maintenance contracts. Use Kempston, and your windows will be sparkly clean. Thank you for visiting Kempston Cleaning Services – your partner in High Rise Window Cleaning Services. Give us a call today so we can assist you with your window cleaning needs.